In the 22 years the "Dr. Who" science-fiction series has been on British television, the central character has maintained an impressive batting average against the forces of evil in the universe. Hopping about the cosmos in a vehicle called a Tardis, traveling backward and forward in time, Dr. Who has, installment after installment; thwarted the most vile of villains. Dreaded Daleks and Cybermen have fallen like intergalactic tenpins to his ingenuity and feats of derring-do. Even that most ruthless of rogues, the despicable Master, has been forced repeatedly to slink away when the Doctor pitched a monkey wrench into his machinations. But earlier this year the seemingly invincible Doctor lost a round. It was not a fatal blow, but it was a distinct setback, delivered by a force at the Doctor's very elbow: the top brass at the BBC. Last February, finding itself with a glut of shows it wished to produce and a paucity of cash with which to produce them, the BBC, which creates "Dr. Who," announced it was postponing filming of the series for several months. "Effectively what happened as a result of the postponement was that we lost one season," says "Dr. Who" producer John Nathan-Turner. "Instead of transmitting the next series in January of 1986, we will be transmitting in the autumn of 1986. "It was simply that the BBC had in the melting pot more programs than it could afford to make. 'Dr. Who' was by no means the only show that was postponed or axed. It was just the one that got all the attention." Attention it certainly got. While the BBC move wasn't exactly front-page news in the United States, 1 of 54 countries where "Dr. Who" is seen in syndication [locally the show airs at 11 p.m. Sunday on WTTW Channel 11], the postponement generated protest calls to the BBC from "Dr. Who" fans around the world. It also resulted in several pop-music stars [including members of the Moody Blues and Ultravox] and series regulars [including Anthony Ainley, who plays the Master] recording a protest song, "Doctor in Distress," in England. A sample lyric: "Doctor in distress / Let's all answer his S.O.S. / Doctor in distress / Bring him back now; we won't take less." "The 'Doctor in Distress' record was made independently of us," says Nathan-Turner, "the proceeds going to cancer research. The record actually sold reasonably well. It didn't make the top 100, but I think it almost did." According to Nathan-Turner, "Dr. Who" should now be free from further tampering. "There are one or two rumors flying around," he notes, "that the next season will be the last. There is no truth in that whatsoever." As long as the series continues to be made, there probably will be conventions organized for "Dr. Who" fans, who are known variously as Who-ites or Whovians. One such get-together will be held in Chicago this weekend, when Nathan-Turner will join a number of actors from the series—including Colin Baker, who currently portrays the Doctor, and Jon Pertwee and Patrick Troughton, two former Doctors—at Tardis 22, a fan convention that runs Friday through Sunday at the Hyatt-Regency Chicago. For information on convention events and ticket prices, call the Tardis 22 hotline: 312-283-DWHO. Now 38, Nathan-Turner became "Dr. Who" producer in 1979, after serving as production associate for both that series and "All Creatures Great and Small." Earlier he had been a floor assistant for news and sports programs and the "Benny Hill" show. Earlier still he had been an actor for three years ["I was lousy, but I worked a lot."]. In his six years as "Dr. Who" producer, Nathan-Turner has worked with three of the six actors who have portrayed the Doctor—Tom Baker, Peter Davison and Colin Baker—and he has watched a number of others assume the role of companion to the Doctor. What follows, in question-and-answer form, are some of his views on the series. What would you consider your best moment as "Dr. Who" producer? "I think," Nathan-Turner says, "the 20th-anniversary show we did, which was a 90-minute program involving the five Doctors who had appeared on the series. Sadly, William Hartnell, the first actor to portray the Doctor, had died some years before, so we recast him with another actor who looked remarkably like him. And Tom Baker wasn't able to take part, but we used some footage from a Tom Baker story that had never been completed. We did manage to get the other Doctors back together for the program. "We made the task even more impossible for ourselves because we decided to bring back quite a lot of companions. The logistics were mind-blowing, and the poor writer had a tremendous job working everyone into the story. I think the virtual simultaneous transmission of that program in the U.K. and in America has got to be the highlight really." "Well, when a season is postponed that you already have scripts for and actors have been engaged for, I guess that's probably the worst moment. "The actor side of last February's decision was okay. Both Colin Baker and Nicola Bryant [who portrays the current Doctor's American companion] will be appearing in the next season. And because we had this hiatus, it did mean that for once we were able to concentrate on the scripts. You see, normally making a season of 'Dr. Who' actually takes longer than one year, in terms of post-production and the casting and so on. So you're commissioning scripts while you're making programs, which is not an ideal way of working. "But rather than being, as it were, forced to use the scripts that we already had on the shelf, we have had- -and have used very gratefully—this period to work on the best possible scripts. It's given us plenty of thinking time, and we have not been idle. I'm probably more excited about next season than 1 have been about any series so far." When an actor portraying the Doctor leaves the show, do you try to cast a distinctly different personality as the next Doctor? "Let's face it, the character of the Doctor is actually very thinly written. So one is always looking for an actor who has a great deal of personality himself—because he himself has to flesh out the role, bring a great deal of himself to the part. I think the six we've had so far have all done that. "With regard to my era, when Tom Baker decided to leave, yes, inevitably I wanted somebody who was totally different to Tom. Which is why I chose Peter Davison. When Peter Davison left, I wanted somebody still with a positive personality but also very, very different to Peter." Have you ever considered a female Doctor? "I think in terms of what we know of the Doctor, it is feasible that he could regenerate into a lady Doctor. But I think, after 22 years, the audience would find it very difficult to accept." If your budget magically doubled, would you change anything in the show? "Inevitably, if you had double the money, you'd want to improve everything all around. I think the one thing I wouldn't do would be to fall into the trap that some of the science-fiction movies have fallen into, which is to assume that a brilliantly shot 20-minute space battle is a substitute for a strong narrative line and writing. "I certainly wouldn't insert more special effects simply because 1 had more money. I don't think 'Dr. Who' has ever been a special-effects show. It's much more a show about the central characters and their involvement with guest characters." Are you aware of the series' international market when scripting a show? "No, we make it for the home market. We're absolutely thrilled and bowled over by the success of the show around the world, but we're not influenced by it. If you're leading up to why the Doctor currently has an American companion, it certainly isn't because of the show's popularity in America. "I've always found it a little far-fetched that many of the Doctor's companions over the years have been from Earth and the U.K. I know Earth is his favorite place, but there comes a point where it really is stretching the imagination. "There is most distinctly a value in having an Earth companion, however. That person asks easily the questions that every viewer is asking. But I decided a few years back to have an Earth girl who was not U.K. So I had an Australian girl. When she left, I decided to bring in an American girl. And we've had a little bit of fun with the characteristics of an Australian and an American. It's a useful comedy device." APA 6th ed. : Popson, Tom (1985-11-29). Dr. Who vs. the BBC: The tale of a superhero's setback and its consequences. Chicago Tribune p. sec. 7, p. F-G.
MLA 7th ed. : Popson, Tom. "Dr. Who vs. the BBC: The tale of a superhero's setback and its consequences." Chicago Tribune [add city] 1985-11-29, sec. 7, p. F-G. Print. Turabian: Popson, Tom. "Dr. Who vs. the BBC: The tale of a superhero's setback and its consequences." Chicago Tribune, 1985-11-29, section, sec. 7, p. F-G edition. 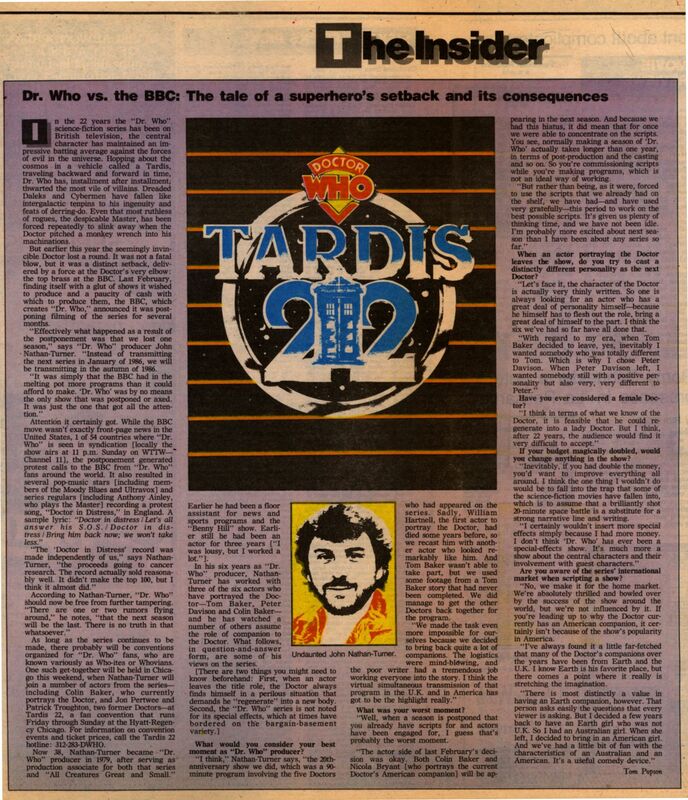 Title: Dr. Who a hit ... and how! This page was last modified on 21 February 2019, at 02:01.